I don’t know about you, but my knee jerk reaction is “what’s wrong with the parents?” I have no doubt there is something there, but I can’t say that tells the whole story. We do know that obese parents are more likely to have obese children. I would lay that at the door of environment, rather than genetics. You don’t get obese without practicing certain habits. Anyone can get overweight without really trying, but obesity, defined as a bmi over thirty, takes overeating and underexercising with a certain amount of effort. You have to see a trend and continue to persist in that path, despite the consequences. The larger you get, the more calories it takes to maintain, so you have to increase your eating to continue to gain weight. Having said this, we now know that genes are responsible for certain aspects of hunger and satiation. ghrelin and leptin are two hormones that control appetite. The production of, and sensitivity to are influenced by both environment and genes. It is a chicken and egg scenario though, does over eating reduce your sensitivity to leptin, the “full” hormone? Or were you already desensitized, and that’s why you got obese? We know that ghrelin makes you crave high calorie foods, but does eating those foods make you produce more? We are only starting to see the full picture on this. Here is a link if you’d like more. Getting back to this poor little boy. As much as I would like to say this was child abuse, it may just be the state of our world for some time to come. I’ve seen in heavy families that not all members gain the same amount of weight. 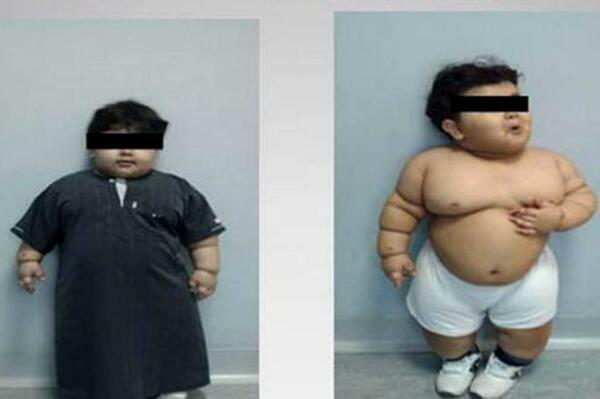 In one family, the older boy was very obese, and the younger perfectly normal. I’m certain both were faced with the same food choices, and the one could not stop, whereas the other could. Of course we want to educate parents about good food choices, and encourage making the right choices, but are they faced with a child who is constantly hungry? I’m not letting them off the hook, the child did not feed himself, but how hard was it to resist a child who is always crying for food? I know, you’ll say- if they were feeding him vegetables he couldn’t have gotten that big. What is my granddaughter eating? Yogurt, raisins, Cheerios, cheese, and what the rest of the family eats. If she binged on those things, could she eat enough to get obese? I would think it’s possible. If her mother was not smart about food choices, and there were chips and ice cream, hot dogs with buns and other high calorie, questionable choices, and she was faced with a child who just kept wanting more, I think it would be easy to go to far. What do you think? Should we just give the parents a blanket indictment? What are the long-term consequences to this little boy and his health from this surgery? Is that better or worse than what he’d face with uncontrolled obesity?